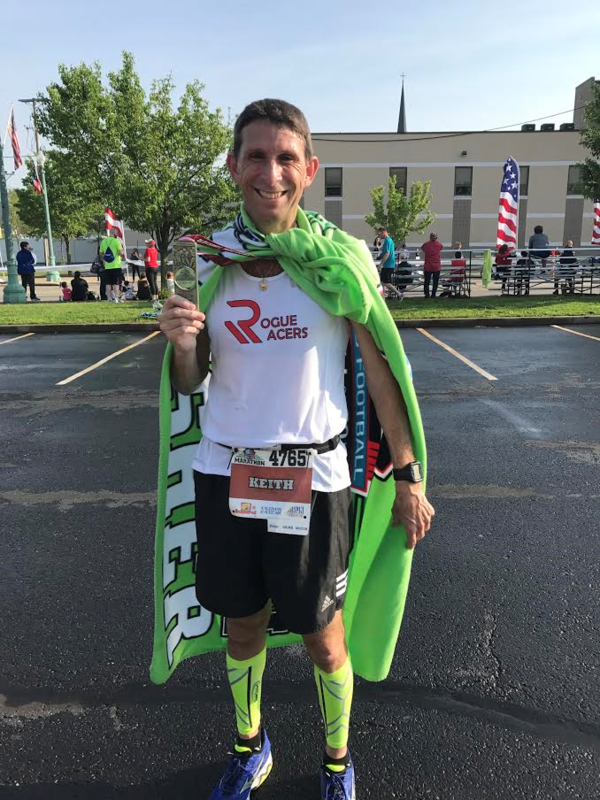 Rogue of the Week – Jason H.
It is close but I love running 5Ks even though they are the toughest, but I also love the challenge of running the marathon. I think the hardest thing for me to deal with in running are the things out of my control. I have had four straight marathons with bad weather. You train for almost six months and the weather has such a huge factor in how you do in a race. I used to run in the same shoe all the time but I rotate a lot now. I race short races in my New Balance Zantes. I run my marathons and long training runs in either my Mizuno Wave Inspires or Mizuno Horizons. I also mix in Mizuno Sayonaras as well. I have short phrases I use to keep myself focused when things get tough in a race. I will say, “I am a warrior” or other short things to get me pumped. I honestly can’t stand missing my running days. It sounds stupid to say that I am never unmotivated but I love to run, otherwise I wouldn’t do it. Would I rather run in 80 degrees than -10 degrees, obviously. But at the end of the day, I really love training. The only time I might feel unmotivated to train is if I have to run on a treadmill. That is no fun. So many things, but mainly friendships, inspiration and competition. I am amazed that I ran by myself for 9 years. I didn’t run a lot, sometimes just 200 miles in a year, but I always ran alone. Now I can’t imagine running without a group. The inspiration comes from seeing how well my friends do in races and it makes me want to get better. And I love to compete with my friends and teammates and see how much better we can get. The Boston Marathon. I have been lucky enough to run in three so far and they have all been different. The first one was great because I finally to run after missing the cut with a qualifying time twice. That first year I tore my calf at mile 7 and still finished. The next year was very hot and I fought through and got my first BQ in Boston. And last year, I ran in the torrential downpour in honor of my wife who was fighting cancer at the time. Nothing was stopping me from running my hardest no matter what the conditions were, and I got my BQ. More importantly, I raised over $17,000 running for the Dana Farber Cancer Institute. I played tennis at Ohio State and for conditioning, we had to run a mile. I was one of the faster runners on the team and I thought, one day I want to run a marathon. After running one, I caught the running bug and kept trying to improve my times. I love running any kind of 800 repeats, track ladders, and mile repeats. Anything on the track is right up my alley. Boston 2018. I always feel like when I tell people about how bad it was, they think I am exaggerating. I would love to run all the world major marathons, but if I had to pick one, it would probably be London. I eventually want to run Boston and then fly to London and do that race the following weekend. I love music and listen to it all the time but not while I am running. I do have a playlist that gets me pumped up before races though. It has lots of Eminem, Kanye, AC/DC, and Bon Jovi.